I think we have all been there. The facebook post is up – Rhianna just launched a new makeup line – there is a shimmering highlighter – and two seconds later you are typing in your card number and giving in to the hype. And most often I’m unfortunately rather dissapointed but not this time! 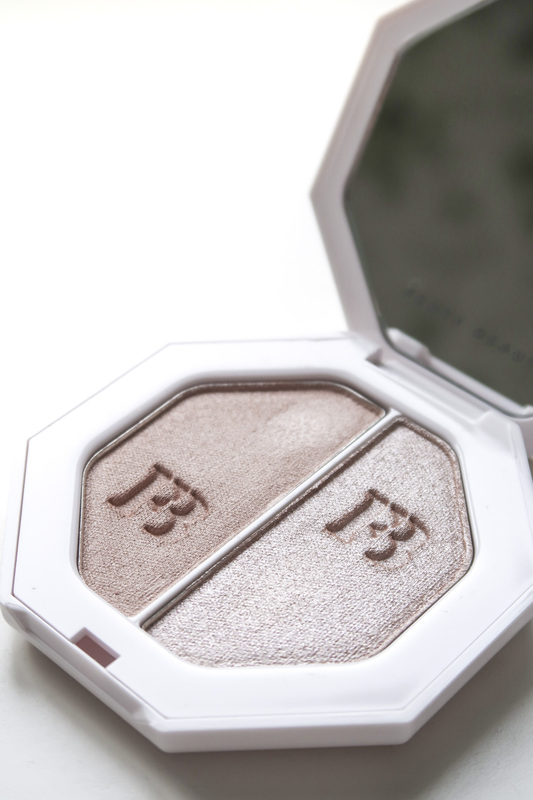 I’ve been on the hunt for a highlighter that is a bit more natural than the Becca Shimmering Skin Perfector Pearl. Something like the Laura Mercier Matte Radiance Highlighter but more like my skintone. 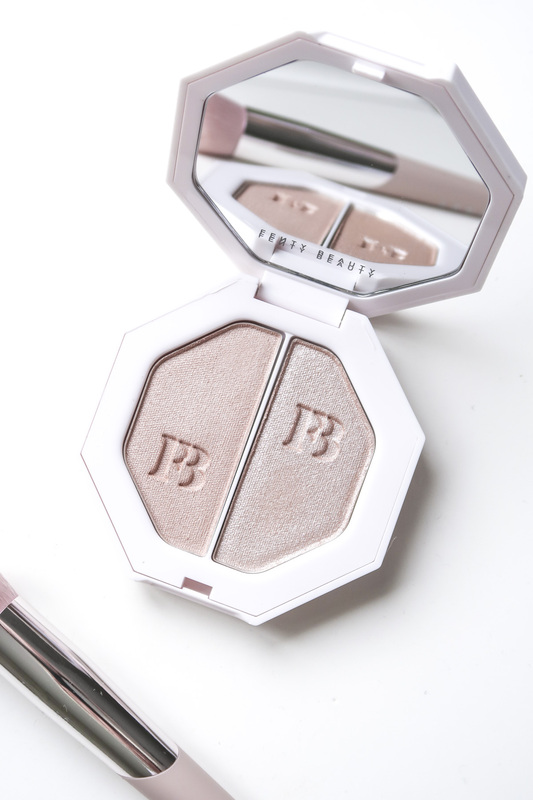 The Fenty Killawatt Highlighter in the color Lightning Dust/Fire Crystal is perfect. It’s like my skincolor but not as pink/purple-y as many other highlighters like it. The left side is a matte, more satin-y texture and the right side is full on glow. I decided to buy two things when the collection launced. 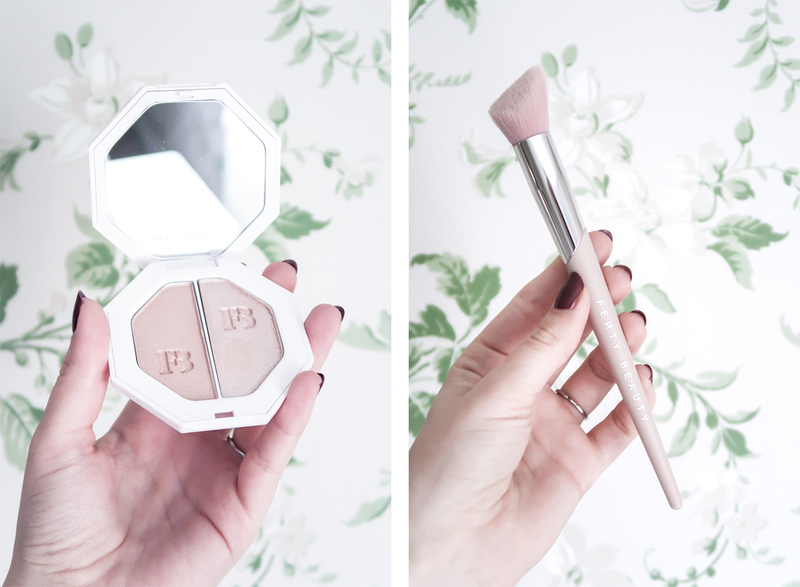 The Killawatt Highlighter and the 120 Cheek-hugging Highlight Brush. The highlighter was something that I was looking for and the brush was just so pretty and uniquely shaped that I couldn’t not buy it. It’s not like any other brush in my collection. It actually works very well for both highlighting the cheek bones, nose, brow bones and inner corners of the eyes because of it’s pointed shape. I usually do a light dusting of the matte highlighter on almost all the highpoints of my face. I then top it off with a bit of the glowy one on the cheekbones and inner corners of my eyes. This ist the way I’ve found is the best to use both shades. Alternatively you got one every day shade and one party shade!